Happy National Library Week! This is the week to rediscover your zest and zeal for our profession. It’s the week of book drives, fine forgiveness, trivia quizzes, marathon readings and all out excitement about libraries. I still have fond memories of a library week I planned years ago with vendor presentations, mini-golf, and dress up as your favorite librarian superhero day. This year’s ALA theme, “Create Your Own Story at Your Library”, has been interpreted in creative ways, from scrapbook storytelling to acting out your favorite story. Some of the more unusual celebrations of our annual event include a perfume workshop at the Barnegat branch of the Ocean County Library System in New Jersey. Sorry, Snookie will not be making an appearance. The Denver Public Library is hosting a meet & greet, with a horse. And it’s not Mr. Ed. It’s the Denver Broncos mascot, Thunder. Thunder’s rider will read some of her favorite horse tales. 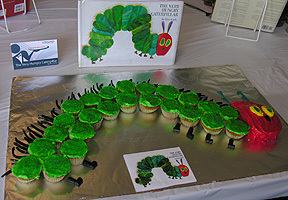 And the Lynden Public Library, in our very own fair state, is celebrating the week with an edible books contest. The branch manager, Sarah Foster, remembers attending a similar event in years past. Her favorite entry was the frying pan filled with gummi worms, representing the book How to Eat Fried Worms by Thomas Rockwell. I might have to head over to Lynden for this one, especially if bystanders are allowed to eat the books. What is your library doing to celebrate National Library Week?